You keep hearing about strengthening the “CORE”, keep your “CORE” tight and “CORE Stability”. What are the “CORE” Muscles? 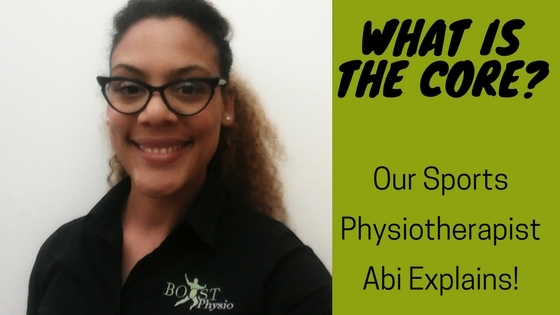 Our Sports Physiotherapist Abi explains what the “CORE” is here. Core Stability refers to the ability to engage a group of muscles of the mid-lower thorax and abdomen. These muscles work in combination with the spine and the nervous system to allow movement, protect the spinal cord and tolerate weight or force placed upon on the body. The deep muscles of the trunk – “the core” act like a corset around our trunk; they co-contract to increase the pressure in the abdominal cavity and create stiffness. These muscles have strong physical links to the surrounding connective tissues that flow into our limbs, which is why having a strong core – or “powerhouse” – can improve the strength in the arms and legs. These deep muscles are made up of the Transversus Abdominus, Lumbar Multifidus, Diaphragm and Pelvic Floor. There are also larger muscles that lie more superficially in our trunk such as the Rectus Abdominis, External Obliques and Erector Spinae. Many refer to these as part of the core and tend to be more visible from the outside i.e. six pack muscles. These function alongside the deep muscle but play a bigger role in generating torque and producing gross movements of the trunk such as an abdominal crunch. As a Physiotherapist, I advise all individuals to do exercises that work both the deep and superficial muscle of the trunk to allow for more efficient locomotion and to better tolerate load and force on our bodies.